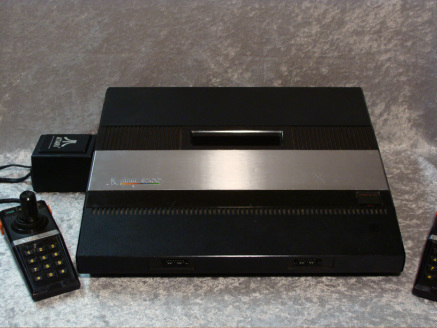 The Atari 5200 SuperSystem, also known as the Atari 5200, was released in 1982 by Atari Inc.with an initial price of $330.00. The 5200 was created to compete with the Intellivision but ended up competing with the Colecovision. The 5200 was based on Atari Inc.'s 400/800 computers and the internal hardware was almost identical. The 5200's controllers feature an analog joystick and a numeric keypad along with start, pause and reset buttons. The 360-degree non-centering joystick said to offer more control than the four-position self centering joystick controller offered with the Atari 2600. There where two versions of the 5200 the four controller and the two controller port. The four controller had a auto RF switchbox that was needed to plug in the power supply and the two port had a separate power supply and non-auto RF switch box.